We didn't know for sure what to expect from the new Superintendent, Dr. Eric Williams, when he presented his first proposed budget. But since he's been talking about the budget with the School Board and the Chamber of Commerce and the Board of Supervisors in various work sessions, meetings, and other communications since last summer, we had some idea. Back in August, Assistant Superintendent Leigh Burden presented a preliminary fiscal outlook that said LCPS would need $53.1 million to pay for increases in salaries and benefits costs, accommodate new enrollment, and open the planned new schools. Any improvements or restorations of past cuts would be extra. At the end of October, Ms. Burden updated the fiscal outlook to $67.1 million to cover those items, factoring in new projections for enrollment and an extra 0.5% increase in salaries to match expected county employees' raises. Again, this did not include any money for restoring cuts or making improvements. All employees whose positions are proposed to be eliminated should be able to be reallocated to other positions needed for growth and enhancements. The School Board will be holding public hearings to listen to your thoughts on Tuesday and Thursday. To sign up to speak at the Jan 20 or 22 hearings, call (571) 252-1020 in advance or sign up at the door before the hearing begins. The hearings are held at 6:30pm at the School Administration building at 21000 Education Court in Ashburn. 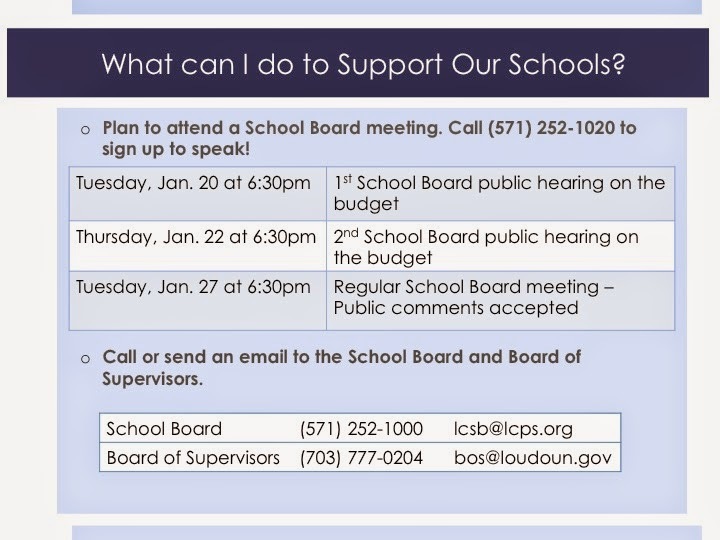 You can also email the School Board at lcsb@lcps.org. The School Board plans to adopt its budget request on January 29. In other news, the Board of Supervisors stuck with their fiscal guidance to the County Administrator in preparing his budget. He will look at both the current tax rate ($1.155) and the estimated equalized tax rate ($1.13) and prepare options for each. The current projected gap between the amount the Superintendent requested and the fiscal guidance would be between $11.2 and $28.4 million. A one penny increase on the tax rate is approximately equivalent to $7 million. New property assessment valuations should be available soon.